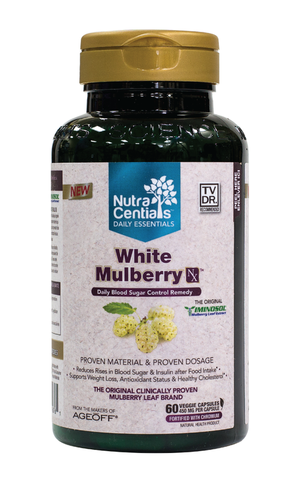 IMINOSOL® is known as "THE ORIGINAL WHITE MULBERRY LEAF EXTRACT" and is derived from the leaves of an Asian super-fruit called white Mulberry. These leaves contain several natural compounds that significantly decrease carbohydrate absorption from food. Provides support for healthy glucose metabolism. An antioxidant. Helps the body to metabolize carbohydrates and fats. A factor in the maintenance of good health. If you have diabetes, consult a health care practitioner prior to use. If you are experiencing symptoms of hypoglycemia including feelings of anxiety, dizziness, tremor, sweating, nausea or headache, discontinue use and consult a health care practitioner. Recommended Dose: Take 1 capsules twice daily. Take with food. Take a few hours before or after taking other medications.